Idaho has a great network of local community airports. Some of these airports have landing strips that are a bit shorter than some pilots might be used to but they offer the opportunity to see new places that are more off the beaten path than a typical mile long runway. This week I flew to Parma, Idaho and Homedale, Idaho for some short-field takeoff and landing practice. Homedale's runway is 2,900 ft long but has displaced thresholds which make it significantly shorter. Pilots can use the displaced threshold for the take-off roll & roll-out but are not allowed to land within the thresholds. The reason for the thresholds in Homedale are that Highway 95 crosses near the end of runway 13 and there are trees at the end of runway 31. The displaced thresholds provide an added margin of safety for the approach but reduce the overall usable length of the runway. Here is a video of some takeoffs & landings at Homedale. The wind was super calm this day & there was minimal air traffic so you see me land one direction and then turn around and take off the other direction. Parma's runway is about 2,700' long. In many cases I could have done a touch and go when landing runway 12 but I was playing it safe and back-taxiing to make sure I had adequate runway for my takeoffs. The last landing in the video at Parma is a touch and go. 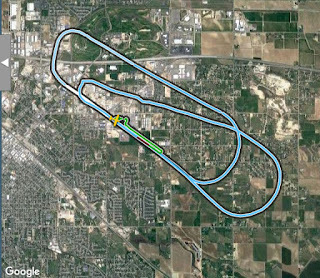 Currently Parma's approach for Runway 12 is right traffic and left traffic for runway 30. This helps keep traffic from flying directly over town. Also, in the Airport Facility directory it recommends landing on runway 30 and taking off on runway 12 when the winds allow. In this video other traffic was departing runway 12 so you see me land and take off runway 12 and then circle around to land on runway 30. The saying, "A Mile of Airstrip can take you Anywhere!" can also be used as a metaphor for the opportunities that these airports provide. These smaller airports promote business and industry and are a great asset to our local communities and economy. One example is Kitfox aircraft in Homedale, Idaho. A few years ago my wife Karma and I had the opportunity to take a tour of their facilities in Homedale. They manufacture amazing backcountry kit built airplanes as well as certified aircraft. Great people producing a great product! Local companies at our small local airports provide employment opportunities and add to the local economy and to the interesting fabric of our communities. Another important role that many of these airports provide to our local farming communities are bases for aerial applicators. When flying into Parma this week I was communicating with a local crop duster coordinating our arrivals and departures. The pilot was super nice and it was inspiring to watch him swoop down over the fields from above. Aerial application pilots have some amazing flying skills. In the video you see him landing in Parma. The roar of that radial engine was a sound familiar to my childhood. I remember being enamored with the local crop dusters when I was a kid. I would run outside when I heard the crop duster's engine in the distance and the pilot would wave to me as he flew over the fields next to our house. A few years ago I was riding my motorcycle next to some fields in southern Idaho and a crop duster flew down next to me and waved to me as he barely cleared the tops of the crops. The Idaho Department of Transportation publishes a Summary of Economic Impact of airports in Idaho every 10 years. The last study was conducted in 2009. This link shows the total employment, payroll and total output of airports in Idaho. We are lucky in Idaho to have so many local community airports and we should protect and promote this valuable industry. Better to be on the Ground wishing you were In the Air...than in the Air wishing you were on the Ground. There is an old saying by Pilots,"It is Better to be on the Ground wishing you were In the Air...than in the Air wishing you were on the Ground." The windsock is straight out and constantly changing direction as it violently tugs at the mast it is attached to. Tumbleweeds roll quickly by on the taxiway, picking up speed as they are whisked away by gusts of wind. The parking brake is set and the gust lock is installed as I position the ladder from the fuel island next to the wing. I climb the ladder carefully removing the fuel caps and add a few extra gallons of 100LL octane fuel to each wing just in case our flight ends up being longer than expected if the weather gets worse. I feel the plane buck and jerk about in the wind gusts as I add fuel. An image of a gust getting under the tail feathers and flipping her over goes through my mind even though I know she weighs nearly a ton. We were originally going to practice stalls today but it is perfect conditions to test my crosswind landing skills so the plan for today's training has changed. My instructor Jim asks me if I am up for flying in these conditions and he gives me the choice. I tell him that I wouldn't fly if I were by myself but I am up for it if he is. We get in the plane, fasten our seatbelts and start going through the checklists. We listen to the AWOS (Automated Weather Observation System) and the winds are gusting from 5-25 knots. The clip in the video describing 9-22 knots is actually after we landed. Both of those are quite a range. At the lower end of that scale I am confident that I can perform crosswind landings easily. I also know that the crosswind component limit the Cessna 182 has been tested by the manufacturer at 20 knots for takeoff and 15 knots for landings. I also realize those tests were made under ideal conditions with a professional test pilot. I am not a professional test pilot and the plane I am flying today is over 50 years old and probably not as agile as it was when it rolled off the production line in 1965. As we roll onto the runway the wind shifts to being almost a direct headwind so we take advantage of the timing and apply full power. I build up a bit more speed than normal to compensate for any gusts before I lift the plane off the ground. Before roll out the wind shifts again and blasts from the right and we crab into the wind as we leave the ground to keep the airplane flying straight down the runway. As we turn from Crosswind to Downwind I get an idea of how strong the winds are by how much farther I am being blown from the runway than normal. I crab the airplane back to the runway in order to fly a somewhat straight pattern. There are two main landing configurations for crosswind landings, the side slip and the crab. I learned the side slip technique in my initial training so that is the technique that I use. As we are coming in I am trying to set up a stabilized approach. We are using a little bit higher airspeed. A general rule is to add about half of the gust to your airspeed on approach. We are also using a maximum of about 20 degrees of flaps so that we have more control authority and so that we won't have as much lift when we get close to the ground. That way a gust doesn't have quite as much of a chance to lift us back into the air when we are close to the ground in our flare. In the side slip technique I am holding aileron into the wind to keep the airplane's path and track lined up with the runway and then using the rudder to keep the airplane's longitudinal axis in line with the runway. In the video you can see that I am a little low and have a lot of power in. That could be compensating for the loss of altitude in the side slip. Also, what doesn't show up in the video is that we are getting bounced around pretty good and it seems that to keep the airplane in line with the runway I am running out of rudder control every once in a while. The approach just doesn't seem stabilized enough for my liking so I opt for a go-around. I used to think that it was somewhat shameful to do a go-around. I had that thinking until I started flying tailwheel airplanes and then I found them to be invaluable for assessing the conditions at an airport before actually landing. Also, there is less margin for error in tailwheel airplanes and things have to be lined up a lot nicer when you touch the ground than in tricycle planes. When I was doing my tailwheel training I did a lot of go-arounds so I got really used to doing them. Before that I tried to stick a lot of airplanes on the ground when I really should have just gone around. Now I say to myself, "If I don't have a stabilized approach on final in the air then it is only going to get worse once I am on the ground." Many backcountry strips don't have the option for a go-around but if the airport has the option I am not afraid to use the go-around if things just don't look or feel quite right. After the go-around we hit some pretty major turbulence off the end of the runway. I cut some of that part out of the video but we were seriously considering flying to a different airport or at least trying to figure out a flight path that would take us away from the approaching storms. I remember thinking that I was really glad that I put an extra 20 gallons of fuel on board when we were considering these options. Just then there was a lull in the weather and I thought it might just give me a big enough window to set it down. On this attempt the wind wasn't quite as strong and definitely not as gusty. You can see in the flight path that once we make that decision I hightail it to the runway to try to land before the wind picks up again. The track with wind barbs shows an average of a 15 knot wind. It was still a pretty stiff crosswind and you can't see it on the video but I am actually landing on the upwind tire only. I then hold it balanced on that tire and as the airplane slows down I add more and more aileron into the wind to keep the windward wing down as long as possible. The other tire comes down and as the plane slows I am all the way to the stops with the ailerons into the wind. We got the airplane down on the ground just in the nick of time as another storm rolled through the area. As I was opening the hanger doors Jim Hudson was in the airplane holding the brakes and adjusting the flight control surfaces to keep the airplane from being damaged. You can see the plane shaking around and me wrestling with the hanger doors trying to get the plane into the hanger. You will also notice a King Air that was also trying to get on the ground but does a missed approach due to the gusting crosswinds. We finally were able to safely tuck the airplane away in the hanger and get the doors closed. This weeks flight training pushed my skills to the limit and I really was happy to be safely back on the ground again after this flight. It was good to prove to myself that I can land in such gusty crosswind conditions but I am looking forward to summer flying with green grass and clear blue skies. During the Winter it can be more difficult to maintain flight proficiency due to inclement weather and limited fair weather flying days. This week we were lucky and the weather cooperated just enough that I was able to fly with flight instructor Jim Hudson. There was a fresh blanket of snow on the runway in Nampa which made for perfect conditions to practice soft field takeoffs and landings. In this video we start off with a soft field take off. To set the flaps we fully lower one aileron and then match the flap setting to the angle of the aileron. This ends up being about 20 degrees of flaps in the C182 we are flying. Making sure we are operating at full power we try to become airborne and get the wheels out of the snow as soon as we can. You can hear the stall horn as I lift the wheels out of the snow. Once above the snow the airplane isn't really ready to fly yet and is in ground effect so we level off about a foot or two above the runway and fly just above the runway until we reach rotation speed and then continue our takeoff. The soft snow on the runway made for some super soft landings. Because the runway was pretty slick I also had to really concentrate on my rudder control to keep the plane lined up with the runway. I also used very minimal braking because the tires would slip when just tapping the brakes. This is a video of landing on the snow covered runway in Nampa. We also did some emergency landing practice which was a little bit scary but really good for building flight proficiency. I have always been afraid of what is sometimes called "The Impossible Turn" and this training gave me a better idea of the minimum heights and conditions at which it can be performed. 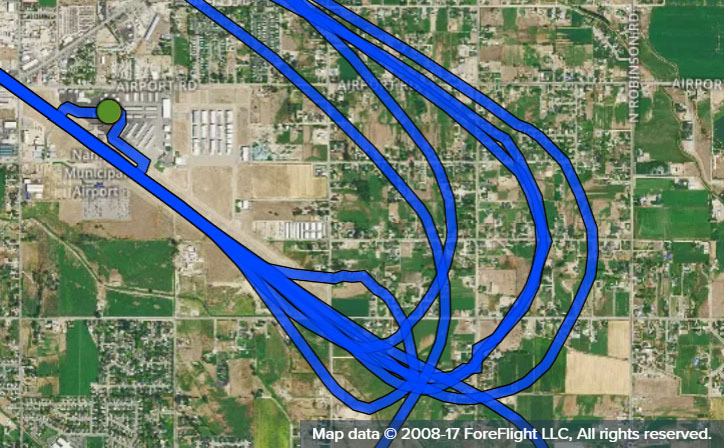 It also really put it into perspective the importance of always having an emergency landing area in mind in case you don't have enough altitude to perform this maneuver. In this case we are in a C182 under full power climbing between Vx and Vy and you can see the altimeter is indicating we are at about 500' AGL when my instructor motions to cut the power. I would never perform this maneuver without a qualified and experienced flight instructor on board unless it was an actual emergency. This video shows me performing a touch-and-go landing on the snow covered runway. After the touch-and-go my instructor motions to fly a bit more over to the right of the runway. You can't hear the audio but he recommends doing that just in-case we were to have an engine failure as it would make it easier to return to the runway if we needed to. Keep in mind I don't know that he is planning to have me perform this emergency maneuver. 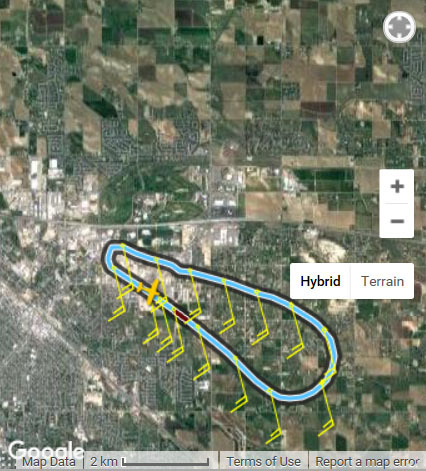 When he motions to cut the power I am really surprised at first but then my past flight training kicks in and I immediately pitch for best angle of glide. Once that is established I start my turn, concentrating on my airspeed, not over banking the airplane, and keeping everything coordinated and the ball centered. You can see that I actually overshoot the turn back to the runway a bit and then have to line it up before we touch down so we actually had even more time than I anticipated. You might also notice that our ground speed is really fast on this landing compared to the others. The reason for that is that we had about a 12kt headwind on the first landing which meant we had about a 12kt tailwind on the emergency landing. This was a great day of learning and I hope I never have to use this training in a real emergency situation but at least I have a better understanding of the limitations and abilities of myself and the airplane. This is a view of the GPS track of our flight from ForeFlight. 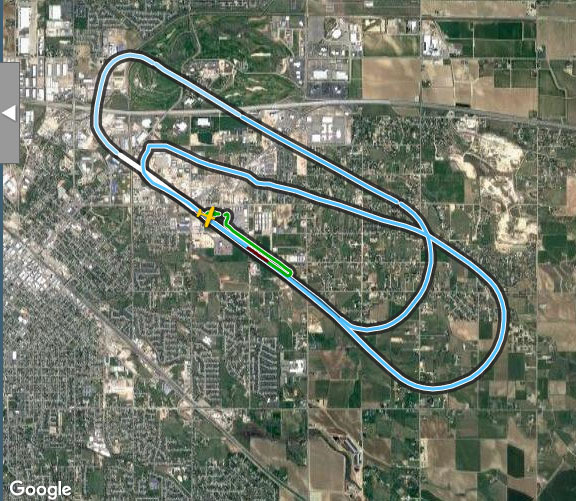 It shows the difference between the track of a normal takeoff and the track of the emergency landing. Instructor Jim Hudson sent me this video of the Impossible Turn that he recorded from our emergency landing flight. The flight was recorded using software called cloud ahoy. Just a reminder that this maneuver should only be practiced with an experienced flight instructor.